Yesterday, I went and watched some of Ms. Trigger’s and Ms. Villeneuve’s students test for their black belts and 2nd Degrees. This day was especially exciting for me because Cameron Clarke was one of those students. I have known Cameron and his family for years now and I remember the first day I met Cam and his dad. They were at a little dragon’s class and I was helping out. Even though we don’t train at the same dojang it’s been a pleasure watching him develop. He has always been there to support me and now I had the pleasure of being there for him. After the test, we all went out to dinner and I had a small gift for Cameron. It was more of a symbolic gift. 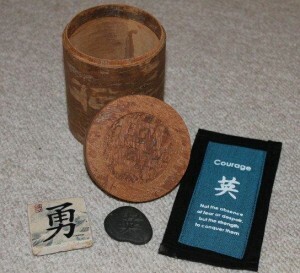 When I got my black belt, my grandma gave me a little wishing box. Whenever I have a goal, a dream or something that makes me happy, I write it down on a little piece of paper and put it in this box. I still do it today. I thought it was time that Cameron got his own box. I found a box that said Happiness on it and I thought that was perfect. My gifts to Cameron were a wishing box for new goals, a book mark that says ‘Courage’ since I love the message on it, a magnet to put on his fridge so he sees it everyday and a rubbing stone with’ Courage’ written on it to remind him to always have the courage to try. 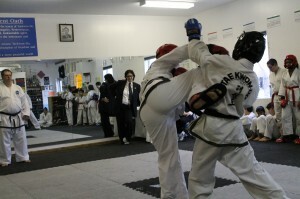 Cameron (and the rest of the students) earning their black belt is not the end. It’s a new beginning with so much ahead of them. Being a black belt is when you really start to learn. The theme of Cameron’s’ gifts was courage. When you are a white belt, it takes courage to set a goal to become a black belt because it can take more than 5 years. When you’re really young, 5 years is a very long time. During this journey to becoming a black belt, it takes courage to get outside your comfort zone, to grow and improve. 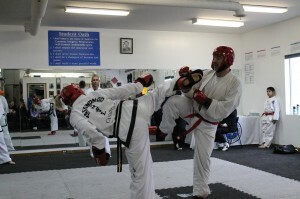 Earning a black belt is a bench mark of how much you have grown as a martial artist and as a person. The coolest part is the black belt is the beginning of this growth. Now that he is a black belt, there is more courage needed. Things change. Now, he is a more serious student, but also a teacher. There is so much more to learn, and the more we learn, the more we realize how little we actually know. 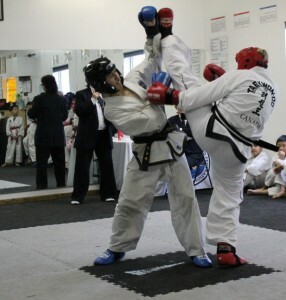 Taekwon-do isn’t just about learning new patterns, learning the history and improving in sparring/self defense. 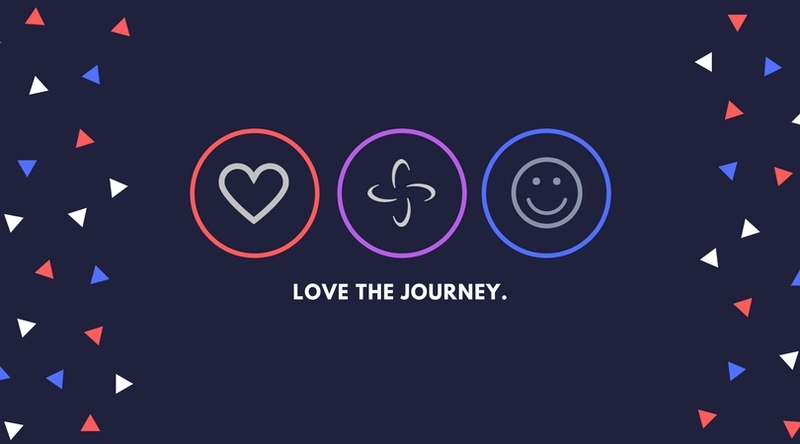 It’s also about growing as a person, becoming more confident, sharing your voice and knowledge, helping your community and your world aspire to being a better place and and living with the morals that TKD teaches us (courtesy, integrity, perseverance, self control and indomitable spirit) and the student oath. 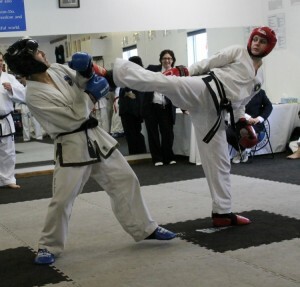 TKD doesn’t stay in our dojangs, it becomes apart of us, and everything we do. 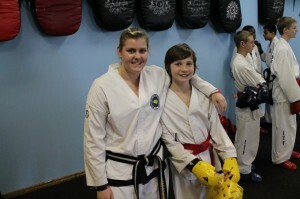 Earning a black belt is just the beginning. When we have the courage to try, we grow, and when we grow we develop a voice that deserves to be shared. We can all make a difference. Congratulations to all the students who successfully passed their test. I would also like to thank Mrs. Clarke for taking all the photos. Wow..is all i can say after reading this. Just like Joanne said, I’m whippping my tears as im writing this. It was a pleasour meeting you, talking to you (cause i’ve heard lots about you) and especially “sparring with my daughter yesterday for her Black Belt Testing (as per my request to Ms. Trigger), it was an honour!..I hope that we’ll continue to see you and I hope that my daughter (Yasmeen) can look up to you and and have you as a “leader/teacher” not just in TKD but in life as well. I was really impress last night at dinner sitting beside you & listening to you talk about your dreams, what you want…. OMG your an amazing young lady Ms. Maduk & thanx for sharing your time & knowledge with Trigger’s students! Thank you is all i can say!